If you have any questions or want to enquire about dates, use our form to contact Gert & Marije Kootstra or see their website for more information. 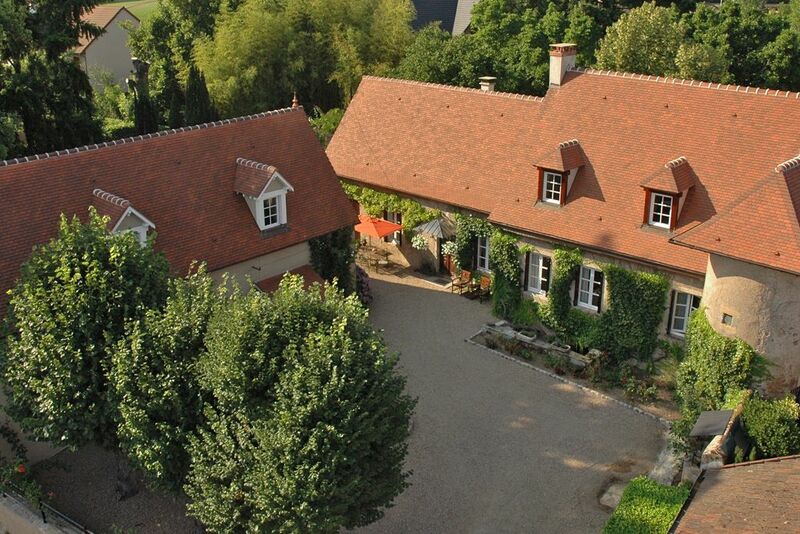 Wrapped in an enchanting landscape of rolling hills and fields dotted with Charolais cattle, is the small village of Issy-l’Evêque and your attractive holiday cottage. Gert and Marije, your Dutch hosts, fell in love with this part of France and have spent years breathing new life into the old curie (the parsonage to the 12th-century Romanesque church) and its gardens. You stay in one of the old outbuildings: ancient beams and tomette tiles have been restored while light floods in through skylights; authentic Burgundy materials blend well with Dutch and Italian design; Gert’s paintings are displayed on white or exposed stonewalls. Downstairs is an open-plan kitchen/dining/living space with a curved steel staircase leading to two large twin/double bedrooms. Cooks will be happy banging pots and pans in the bright kitchen while others can lounge on sofas in front of the wood-burner or sip wine at the dining table. The peaceful bedrooms each have their own neat en suite hidden behind a screen. Wander the gardens, hit the wine tours, thermal spas at Bourbon-Lancy are close; your hosts know the area well and can advise. Special offer: The garden is at its best in May! Book a week in May and you will receive a € 75 discount on the rental price. Minimum stay: 7 nights. Children over 7 welcome. Pets by arrangement. Restaurants nearby. Dinner with wine by arrangement, €25. Have you visited Clos Laraison? Be the first to leave a review. Tranquillity, space, and nature. Walks in lovely landscape, good food, wine tasting. Sleeping underneath impressive ceiling beams and awaking to the sound of birds chirping in the garden. Cooking up culinary delights on a semi-professional range cooker, firing up the wood stove, or simply immersing yourself in a good book out in the rose garden. Enjoy nature or cultural and historical sites, which can be perfectly combined with Burgundy gastronomy and a visit to the famous vineyards. In short: living the good life, Burgundian style!